One more time, current Bolivian central government comes with the worst possible economic policy. Figures. In 2012 this sector reported profits by $186 million dollars. The rest of the system generated only $35.7 million. Through the new law of financial services, the State seeks to control 50% of the profits generated by banks and other financial institutions of the country. So did the Vice-President of Bolivia, Alvaro Garcia Linera said, according to the ABI news agency report yesterday [February 15, 2013]. 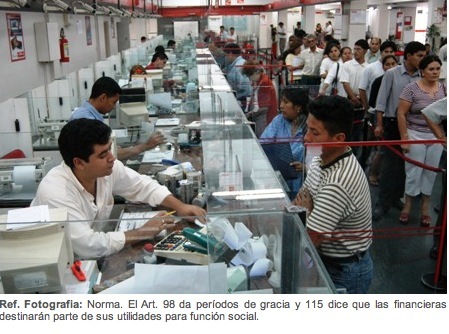 The new law was discussed in the National Congress, intended to regulate the growth of the financial, provides control of interest rates and gives full authority to the Authority’s Supervision of the financial system (ASFI), to define the degree of expansion of the regulated [Bolivian private banking system]. The project was presented by the Government to the private sector which noted 11 articles of the norm. Control. The head of State told ABI that close to 50% of the profits of the banking should remain in the hands of the State, within the framework of the State regulation on interest rates. On the other hand, Garcia, said that the Government will maintain the stability of the financial system, ensure resources, property, operation, safety and resources of each of the savers. The control of interest rates was observed by representatives of the banks and financial institutions in a meeting Thursday with the Minister of economy, Luis Arce, in which the latter rejected the remarks made by the bankers. In 2012, according to data from the ASFI, the Banking alone reported profits by $186 million. The rest of the system had a turnover of $35.7 million dollars in that year. The Government is wrong in this matter, no doubt has good intentions in wanting to control interest rates and believes that controlling where goes the credit the economy will move forward better, but it is not true. These measures already had been applied up to the year 1985, when the Government even decided where and to which sectors would be lent the money, and it was a failure. The subject of interest rates is very complex because there are different and depending on the size of each institution markets, some may give lower rates and other lower. It is a very complex and competitive business. • Article 23. Several paragraphs of this article, give full authority to the ASFI to control the sector. In its paragraph (d), gives powers to the regulator to “Define the degree of growth and expansion of the financial system, its coverage, characteristics and other aspects that guarantee all Bolivians’ access to financial services”. • Article 60. Active interest rates will be regulated by the executive organ of the central level of the State through Supreme Decree establishing maximum limits within which financial institutions may agree with their customers in the framework of the provisions of the present law for the productive sector and social housing loans. • Article 61. The ASFI will establish maximum levels of commissions, fees and other charges that financial institutions may charge consumers for financial operations and services. Populist demagogue at its best!!! Tax/control those of the private sector who are more competitive, hence have profit… How about those small savings & loan who went belly up? Where was the government to overlook at those organizations that misled their clientele? We can also observe the entrepreneurial reaction?… or lack thereof…?! Bolivian private sector is held hostage and frightened with current political behavior.